Eliot's own notes to his masterpiece were described by Eliot himself, as Rainey here relates, as padding that took on a life of its own as the controversies surrounding the poem took off in the '20s. That's just one of the tidbits in this terrific edition of a modernist work that retains its power to shock, as well as a high degree of allusive difficulty. Rainey's essay and notes describe the poem's genesis and printing history, and carefully-without damaging the poem's many ambiguities-elucidates most if not all of its textual knots. 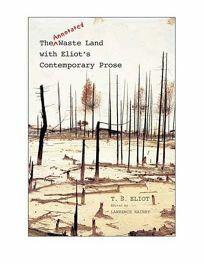 The setting of the poem itself follows that of Eliot's preferred edition. One still misses the now out-of-print manuscript version of the poem (complete with Pound's interventions), but for the student or for anyone who wants to get the maximum amount of information out of a foundational modernist work, this is the best available edition.